At this point in time, we should all think of something to pray for. The world is so full of evil. We should pray to end abortion, divorce, suicide, homosexuality, impurity, and war. But, more importantly, we should pray for the conversion of sinners. Why? Because Our Lady of Fatima said, "Souls go to hell because they have no one to pray and make sacrifices for them." If we only knew how many souls go to hell! St. Vincent Ferrer said, "Know, Monsignor, that at the very hour I passed away, thirty-three thousand people also died. Out of this number, St. Bernard and I went straight to heaven, thee went to purgatory, and all the others went to hell." How many damned souls there were, in one hour! How can we save them? By prayer, perseverence, and sacrifices. We should always pray for the conversion of sinners, and offer up our little trials of our day for them. If you save even one soul, you have assurance of your salvation. We may also think: "How did all those people get damned?" Well, by not praying, or not praying enough, by following the world and worldly pleasures, and by impurity especially. Our Lady of Fatima also said, "More souls go to hell because of the flesh than any other reason." It is sad to see how impure our world is today. Please, pray for the conversion of sinners, because Our Lady of Fatima predicted that our future would be worse than the Flood, if we don't turn to God. O Immaculate Heart of Mary, refuge of sinners, I beg of you by the infinate merits of the Sacred Heart of Jesus, and by the graces God has granted you since your Immaculate Conception, the grace of never going astray again. Mother, keep me, a sinner, constantly bathed in the light of your Immaculate Heart. O Immaculate Heart of Mary, in union with all my brothers and sisters throughout the world, I freely consecrate myself to your Heart, Immaculate and pure. Please accept this personal consecration as an act of reparation and for the conversion of sinners. O Immaculate Heart of Mary, I love you! 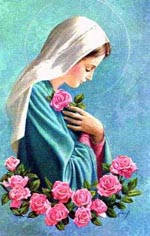 And I wait patiently for the day that your Immaculate Heart will triumph. I humbly lay down my soul in the light of your purity! Immaculate Heart of Mary, be my refuge, and the way to the eternal light of Jesus, our God. Amen. Holy Mary, help the helpless, strengthen the fearful, comfort the sorrowful, pray for the people, plead for the clergy, intercede for all woman consecrated to God, may all who keep your sacred commemoration experience the might of your assistance. Amen. O Most holy Virigin Mary, Queen of the most holy Rosary, you were pleased to appear to the children of Fatima and reveal a glorious message. We implore you, inspire in our hearts a fervent love for the recitation of the Rosary. By meditating on the mysteries that are recalled therein may we obtain the graces and virtues that we ask, through the merits of Jesus Christ, our Lord and Redeemer. Our Lady of Guadalupe, mystical rose, intercede for the Church, protect the Holy Father, help all who invoke you in their necessities. Since you are the ever Virgin Mary and Mother of the true God, obtain for us from your most holy Son the grace of a firm and a sure hope amid the bitterness of life, as well as an ardent love and the precious gift of final perseverance. Holy Mother, your soul was pierced by a sword of sorrow at the sight of the Passion of Your Divine Son, intercede for me and obtain for me from the Lord (enter petition). Sacred Heart of Jesus, today I wish to live in you, in your grace, in which I desire at all costs to persevere. Keep me from sin and strengthen my will by helping me to keep watch over my senses, my imagination, and my heart. Help me to correct my thoughts which are the source of sin. I beg you to do this, O Jesus, through Mary, Your Immaculate Mother. Blessed Virgin Mary, who can worthily repay you with praise and thanks for having rescued a fallen world by your generous consent?! Recieve our gratitude, and by your prayers obtain the pardon of our sins. Take our prayers into the santuary of heaven and enable them to make our peace with God. Holy Mary, help the miserable, strengthen the discouraged, comfort the sorrowful, pray for the people, plead for the clergy, intercede for all women consecrated to God. May all who venerate you fell now your help and protection. Be ready to help us when we pray, and bring back to us the answers to our prayers. Make it your continual concern to pray for the people of God, for you were blessed by God and made worthy to bear the Redeemer of the world, who lives and reigns forever. Amen. O Virgin Mother of God, Mary Immaculate, we dedicate and consecrate ourselves to you under the title of Our Lady of the Miraculous Medal. May this medal be for each one of us a sure sign of your affection for us and a constant reminder of our duties toward you. Every while wearing it, may we be blessed by your loving protection and preserved in the grace of your Son. O most powerful Virgin, Mother of our Savior, keep us close to you every moment of our lives. Obtain for us, your children, the grace of a happy death, so that, in union with you, we may enjoy the bliss of heaven forever. Amen. O Mary, concieved without sin, pray for us who have recourse to you. O Mary, concieved without sin, pray for us who have recourse to you. O Mary, concieved without sin, pray for us who have recourse to you. O ever Immaculate Virgin, Mother of Mercy, Health of the sick, Refuge of sinners, Comfort of the afflicted, you know my wants, my troubles, my sufferings. Look upon me with mercy. When you appeared in the grotto of Lourdes, you made it a privileged sanctuary where you dispense your favors, and where many sufferers have obtained the cure of their infirmities, both spiritual and corporal. I come, therefore, with unbounded confidence to implore your maternal intercession. My loving Mother, obtain my request. I will try to imitate your virtues so that I may one day share your company and bless you in eternity. Amen. Mary, my Immaculate Mother, I desire to offer you reparation for the offenses which your Immaculate Heart recieves from the horrible blasphemies which are uttered against you. I offer you these praises to console you for so many ungrateful children who so not love you, and console the Heart of you Divine Son who is so deeply offended by the insults offered you. Recieve, my purest Mother, this little act of homage. Make me love you more each day and look with pity on those blasphemers that they may not delay to cast themselves into your maternal arms. Amen.